After trying out Miss Kookla's amazing roasted squash, cranberry, and sage recipe, I decided to try my hand at roasting the squash seeds. The process is pretty easy. 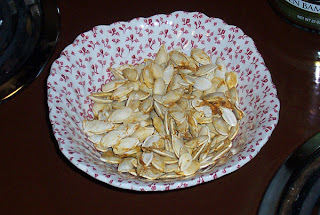 First, do your best at separating the "guts" of the squash from the seeds. Don't drive yourself crazy... you won't remove it all, and that is ok. Boil the seeds in salted water until they are grayish - bout 5-10 minutes, and then drain. I have read that allowing the seeds to dry overnight is a good idea, but I decided to let them dry only for a little while. I laid them on parchment paper on a pizza stone although you could use a regular cookie sheet. I sprinkled them with some sea salt and roasted them in the oven on 350 for about a half hour, flipping them around with a spatula about halfway through. The final result was pretty much what I expected, although next time I will go easy on the salt. I certainly reccommend making these if you have the opportunity instead of throwing the seeds away, although if you decide to try Kookla's recipe (and I think you should... it is incredible, I have already done it twice) then save yourself the hassle of peeling the squash and buy it pre-skinned instead. yeah when i made acorn squash recently i thought about getting creative with the seeds like this but i didn't feel like experimenting. maybe i will next time, didn't sound too hard.